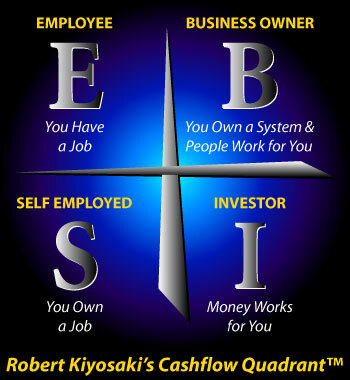 Money can be made and fulfillment can be achieved in any quadrant. 80% of people are E & S and have 20% of the money. 20% of people are B & I and have 80% of the money. Majority and minority would be more accurate terms; I guess numbers are more impressive. Where am I now and where do I want to be? Technically, I’m an employee for the IDF; I will probably be fulfilled in my military service. On the other hand, I might not achieve financial freedom as quickly as I’d want to. I can be self-employed, as I was in the past, and do things like private teaching, personal training, article translation, and these are all great, fun & profitable. I want flexibility, to serve others, and to not necessarily be dependent upon them. Internet marketing looks like it pretty much fits the description, you market products/services (later on about how this works) and get paid for it. You can do it in the middle of the night, sitting in the train, you can stop doing it for a while, and it still works. + I love the internet and I love marketing, as long as it’s not in someone’s face. I had some experience with B since I had a business of Network Marketing, it didn’t work out that well, I don’t regret it, a lot was learned and experienced, wouldn’t take back one dime. I also have an idea (at least one) for a start-up company, but I just don’t feel it’s time yet. Investing is probably the best way to earn money if you already have some / an income. I invested once, but since I don’t have an income now, this will wait.